Something very exciting is happening next Summer that has been in my calendar for a while now, my cousin is getting married and I'm going to be one of her bridesmaids! The wedding is going to be some time in August, so hopefully it's going to be a lovely Summer wedding. As weddings can be extremely stressful to plan, I volunteered to help my cousin pick the bridesmaids dresses and maybe even do the make-up on the day of the wedding! My cousin already has her wedding dress picked out, it's very traditional, white, strapless, satin, it's absolutely beautiful! The maid of honour and flower girl also have their dresses picked out, the maid of honour's dress is floor-length with straps and a crossover back which is like a dusky pink colour. The flower girl's dress is absolutely adorable, it's such a little princess' dress which is chiffon, light pastel pink with little dusky pink flowers embellished on it. So, the biggest task left was finding dresses that would both fit myself and my 15 year old cousin, who is much taller than me. So, that's when I kicked into good bridesmaid mode, started my research and stumbled across Aviva Dress. They have so many amazing dresses, from wedding dresses, bridesmaid dresses, prom dress and other special occasion dresses that come in a variety of shapes, sizes, materials and colours. My cousin actually wanted our bridesmaids dresses to be a light pastel pink and floor-length to match in with both the maid of honour's dress and the flower girls dress, that was the only guidance she gave me, the rest was entirely up to me. So, I've picked out five absolutely gorgeous light, pastel pink floor-length dresses to present to my cousin and hopefully she likes them. One of the best thing about Aviva Dress is that you can pick your normal size, but you can also get it custom made. So for me, I can definitely benefit from getting the length taken up a few inches and taken in at the bust. You can also pick from a massive range of colours, so if you like the style of the dress shown but you're not sure of the colour, you can change it no problem! You can also choose when you want your dress to be delivered, which is so convenient because you can arrange to be at home or for someone to be there whenever it arrives. I don't even want to total up the time I've spent on this website, not just searching for bridesmaids dresses, but also looking at the formal and prom dresses, wishing I would have found it whenever I had my formal two years ago, how time flies. I know there are a lot of formals/proms coming up shortly, so maybe if you or someone you know is looking for a really stunning dress, you could check them out as the dresses are such a reasonable price as well. Or for all you eager beavers out there, the festive season will soon be upon us, which means getting dressed up and looking glamorous for all those Christmas parties! So, what do you think of my top 5 dresses? 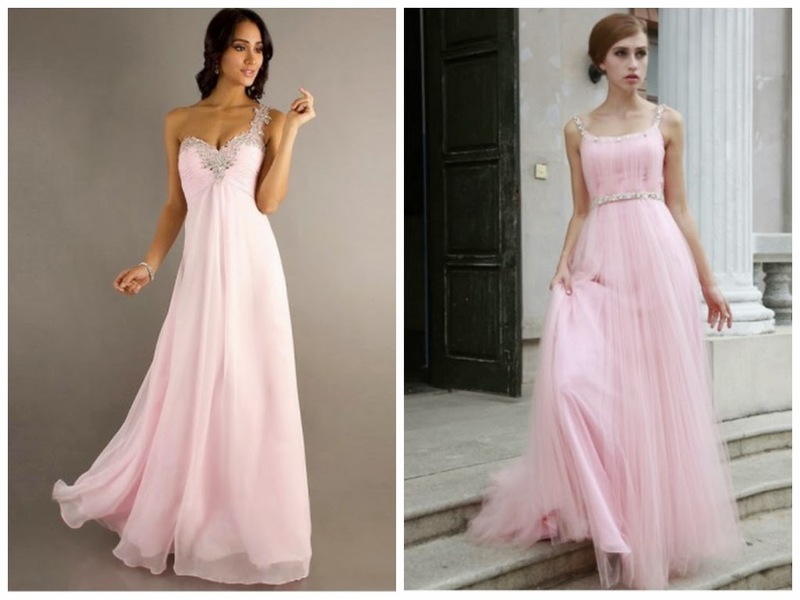 Which one do you think would be best for bridesmaids dresses? Let me know in the comments! My favorite would be 2nd and 3rd! Ohh wedding! Personally the fourth one would be beautiful and elegant. It's got a hint of maturity and sophistation but it would still be 'wearable' for a 15yr old too. And it has a bit of bling on the strap and neckline....that's just screaming CLASSY!